The main difference between HTML and HTML5 is that the HTML is a standard markup language for creating web pages while the HTML5 is a newer version of HTML with additional features such as web sockets, canvas, and geolocation. HTML is a markup language to create the structure of a web page. It consists of tags, and the web browser displays text, tables, lists and other elements on the web page according to these tags. HTML is easier to learn compared to programming languages such as C, C++ and Java. 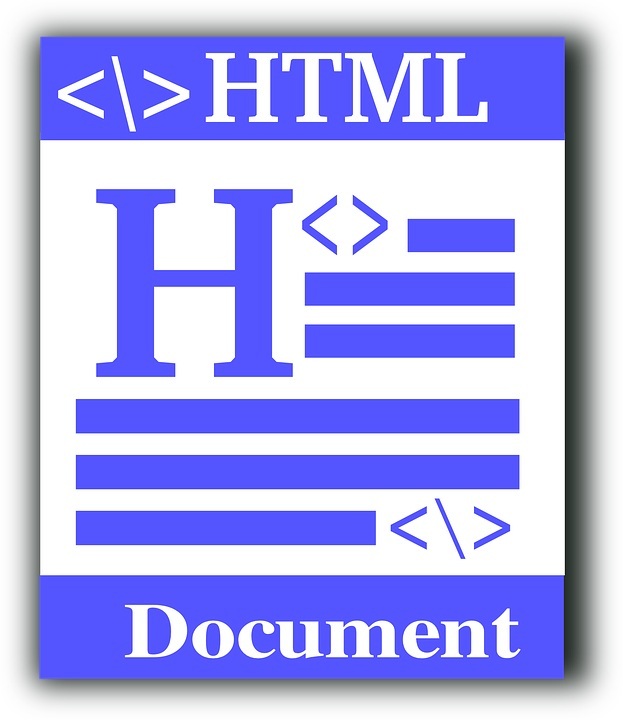 Moreover, a programmer can easily create an HTML file using a text editor like notepad and execute it on a web browser. There are two main sections in an HTML page. They are the head section and body section. The head section includes the title and the metadata of the page while the body section includes all the visible content of the web page. In addition, HTML has tags to represent various elements such as paragraphs, headings, tables, and, lists. There are various versions of HTML as HTML 1, 2 etc. The latest version of HTML is HTML5. HTML5 is the new revision of HTML, superseding HTML 4.01, XHTML 1.0 and XHTML 1.1. It is a cooperation between the World Wide Web Consortium (W3C) and the Web Hypertext Application Technology Working Group (WHATWG). HTML5 supports all web browsers such as Firefox, Chrome, Safari, and, Opera. Furthermore, mobile web browsers pre-installed on iPhones, iPads, and Android also have excellent support for HTML5. 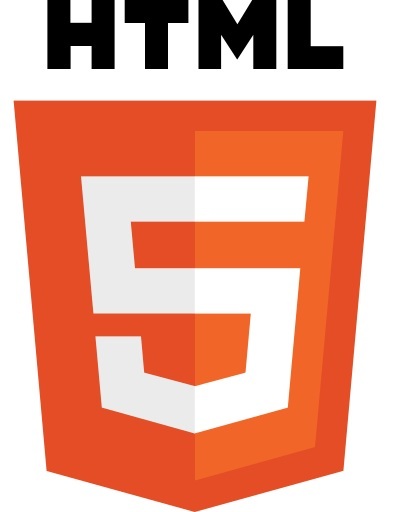 HTML 5 provides a number of new features. Some of them are as follows. Forms 2.0 – Enhancement of HTML web forms. There are new attributes for <input> tag. WebSocket – Provide bidirectional communication technology for the web application. Drag and Drop – Allows dragging and dropping items from one location to another location on the same webpage. Video and Audio – Allows embedding video and audio on the webpage without using third-party plugins. Geolocation – Allows the new visitors to share their location with the web application. HTML5 is the latest version of HTML. HTML is the major markup language used to display web pages on the Internet. HTML 5 is a major revision of HTML for describing the content and appearance of web pages. Hence, this is the fundamental difference between HTML and HTML5. Moreover, HTML is an older version whereas HTML5 is a new version. Another difference between HTML and HTML5 is that the HTML works well in older browsers while HTML5 works well in new browsers and also supports older browsers. Furthermore, HTML is less detailed while HTML5 is more detailed. 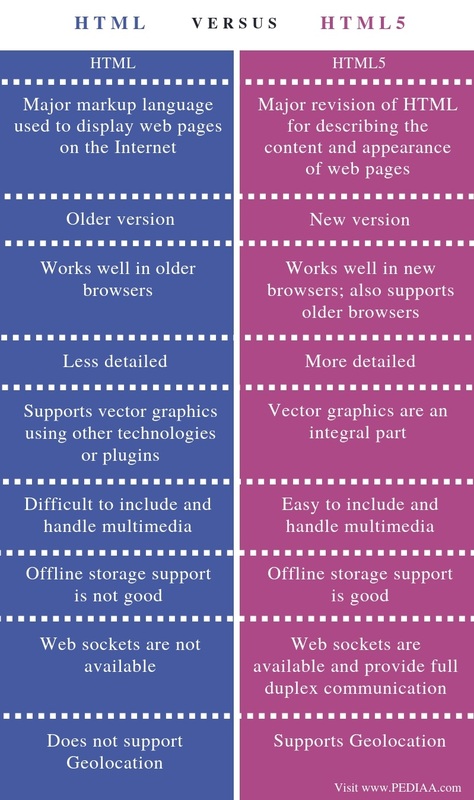 Vector graphics is another difference between HTML and HTML5. HTML supports vector graphics using other technologies or plugins. However, vector graphics are an integral part of HTML5. It is difficult to include and handle multimedia in HTML. However, it is easy to include and handle multimedia (audio, video, etc.) in HTML5. Therefore, multimedia usage is an important difference between HTML and HTML5. Also, the offline storage support attributes to one other difference between HTML and HTML5. The offline storage support is not good in HTML, whereas HTML5 supports offline storage very well. Web sockets are not available in HTML. However, web sockets are available in HTML5 and provide full duplex communication. This is another difference between HTML and HTML5. Additionally, HTML does not support Geolocation, but HTML5 does. In brief, HTML is a standard markup language for creating web pages and web applications while HTML 5 is markup language which is a newer version of HTML that is used to structure and present content on the World Wide Web (WWW). This is the main difference between HTML and HTML5. 1. “HTML Overview.” Www.tutorialspoint.com, Available here. 2. “HTML5 Overview.” Www.tutorialspoint.com, Available here.